Camping is one of those things I always imagined I’d do with my kids, and now that I have kids, the idea of trying to sleep outside (not to mention all the prep, packing, and hauling) is . . . not a bit appealing. I prefer my camping to take place in picture books and chapter books. Maybe some s’mores made over the kitchen stove. (P.S. If you’re looking for a summer reading list for adults, I put together a summer reading guide last week that I’m totally thrilled about). Let’s Sing a Lullaby with the Brave Cowboy by Jan Thomas – I think Jan Thomas is the master of very early comedic books. This one, about a cowboy singing a lullaby to his very skittish cows, is a family favorite. Postcards from Camp by Simms Taback – Michael is not a fan of sleepaway camp. And his postcards home to his father detail all the reasons he wants OUT. The Woods by Paul Hoppe – Ella can’t get enough of this book about a little boy who, at bedtime, loses his beloved stuffed animal and must venture into the terrifying woods to reclaim it. A Couple of Boys Have the Best Week Ever by Marla Frazee – When they go to spend the week with grandparents, it’s supposed to be nature camp, but it turns out to be a lot of eating sugar and watching cartoons. Lucille Camps In by Kathryn Lasky and Marylin Hafner – When her dad and older siblings take off camping without her, Lucille and her mom decide to camp at home, complete with a tent and s’mores. Poppleton in Spring by Cynthia Rylant and Mark Teague – Embarrassingly, I’ve never read a Poppleton book until now, but I’m hooked. And apparently I really love books featuring pigs. Quiet Night by Marilyn Singer and John Manders – Marilyn Singer does such great books, and this one, about how noisy it is camping in the woods, delighted my daughters with all the sounds and rhythms. The Princess and Her Panther by Wendy Orr and Lauren Stringer – Two sisters (as you might have guessed, the younger is conned into being the panther) go camping. Doing so might require some bravery. The Lost Lake by Allen Say – I love Allen Say’s distinctive and Caldecott-winning art and storytelling, and this is no exception, about a boy and his very quiet father who set out to find a lost lake. Runaway Ralph by Beverly Cleary – Ralph is ready to go out on the road with his motorcycle and ends up at a summer camp when he’s captured by a lonely camper. Alvin Ho: Allergic to Camping, Hiking, and Other Natural Disasters by Lenore Look and LeUyen Pham – The Alvin Ho series is fantastic (somewhat similar to Diary of a Wimpy Kid) and in this one, Alvin Ho is forced to confront all his worst outdoorsy fears. Poor guy! Lunch Lady and the Summer Camp Shakedown by Jarrett J. Krosoczka – This is one of my favorite graphic novel series. They are so clever and funny; I’ve never met a kid who didn’t love them. We did backyard camping once. The kids had a blast and I'm sure we will do it again and/or go actual camping, but my least favorite part was the sleeping part. So uncomfortable. Tumble Bumble is one of our favorite board books. Love it. Camping is never something I imagined doing with my kids. I dislike it myself, and I know that doing it with my family just means a whole lot of work for me and very little sleep. However. My husband is Mr. Outdoors, my older son is Mr. Junior Outdoors, I have another son who I'm sure is going to follow his older brother's lead, and one more kid on the way. With three kids, camping is probably the only kind of vacation we will ever be able to afford. As long I have a baby, I'm excused from camping, but as soon as Kid #3 is around two or so, all bets are off. I dread this, but am resigned. I feel the same way…camping in a tent with kids sounds like a lot of work. Maybe a camp trailer? But that is expensive, so I'll just stick to other things. I loved camping as a kid. I am kind of over it as an adult. BUT I do hope to do it with my kids for their sake. I agree it's a lot of work and discomfort, but the memories! Camping is fun but it's also a lot of work, and I don't have any kids to add to the mix. I can only imagine what an endeavor that is! These lists are wonderful! I'm so glad you're doing them all summer! I just got Lets sing a lullaby with the brave cowboy and loved it. In fact, we picked up many of the author's other books and enjoyed them immensely. We just loaded up on books at both local libraries. My kids have read Bear in Underwear by Todd H. Doodler about a dozen times each and laugh themselves silly each time. It's not exactly about camping, but I think the woodland creatures theme fits right in. We're deep into summer reading contests right now, so more books are always welcome! My two-year-old's favorite is Goodnight, Goodnight, Construction Site. My son is obsessed with the llama llama books right now. We read Llama Llama Red Pajama every night before bed. Sounds like fun! Thanks so much for your lists. I walk into the library with my 7 and 9 year olds trying to find chapter books both they and I will approve of without much luck. Your list gives me some sort of jumping off point. They're worth it, Heather! I just renewed my subscription. 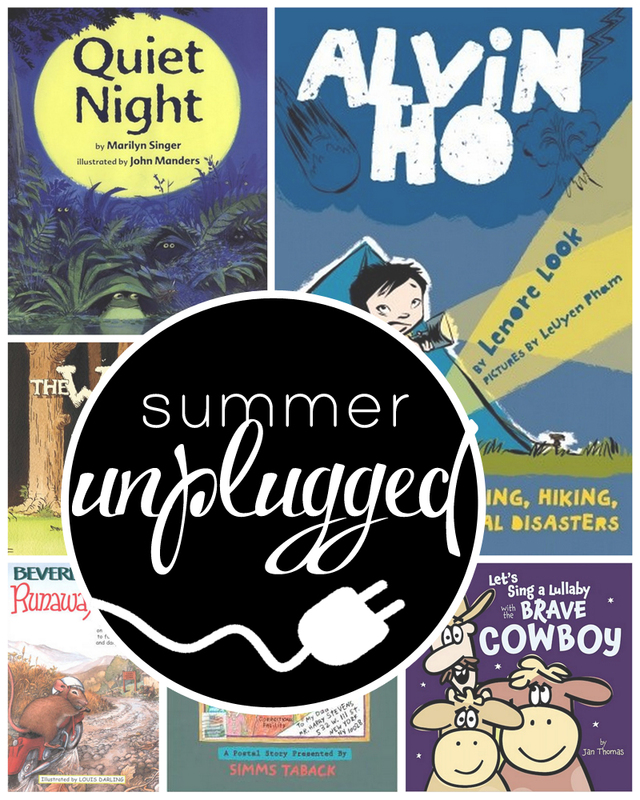 Summer Unplugged is a great idea. Thanks for doing the research for us all. My son is in love with Duck on a Bike lately. Have you read Exclamation Mark by Amy Rosenthal? My 2- and 4-year old both love it. And always Elephant and Piggie. Love your reading lists! I immediately put them on on hold for my daughter! Thank you! Toot and Puddle books by Holly Hobbie sound perfect for when you're out on an adventure! We could use this. Doing lots of camping this summer. We love anythin Elephant and Piggie and Pete the cat. Our favorites are series about friendship pairs. I highly recommend the Elephant and Piggie series by Mo Willems. Both Mr. and the 3-year-old love them. We also obsessively check the My Milk Toof blog because the two books Inhae Lee has published just aren't enough. Some other suggested series are Pip and Posy by Axel Scheffler, Duck & Goose by Tad Hills, and anything by Olivier Dunrea. Mr. thought Stuck by Oliver Jeffers was HILARIOUS and could not stop laughing throughout the entire book. But he was the only one. For some reason my daughter loves this ridiculous potty training book! But in reality, our favorite board books are the BabyLit books! They are awesome! Since camping books are on my mind, I'd say The Berenstain Bears Go to Camp. My 6 year old checks out one (or more) Berenstain book(s) every time we go to the library. I'll second the recommendation a few comments earlier for Toot and Puddle books. My daughter loves the Fancy Nancy series. She is particularly fond of Fancy Nancy and the Posh Puppy. I'm blaming these books for her insistence on wearing dresses and jewelry everyday! It's not a camping book, but This Moose Belongs to Me by Oliver Jeffers is outdoorsy. Very good list. Where going camping this weekend so I think I'll go check some out to read to my girls. I LOVE to camp with my kids. My normally princess dressup girls have a great time exploring. Sadly this year I have to admit defeat with too many little ones to go "real camping." We're going to substitute with going to a campsite to play a lake, have tin foil dinners, s'more, some star gazing, and then a drive home to our own beds. I sure hope you went camping at Cape Cod when you lived in Boston. It was one of our favorite traditions when we lived there. Oops, and a book recommendation- Just Me and My Dad. We love Little Critter. I only camped a few times growing up, and always with my friend's family. My mom was a single mom and we didn't have the means for a tent, etc. And my friend's parents had an RV, so I think I slept in a tent maybe once or twice. I'm pregnant with our first and while taking her camping sounds like fun, I'll be realistic and say it probably won't happen. 🙂 I do want her out enjoying nature as much as possible, but a hotel bed at the end of the day sounds much better! This is encouraging to me! How many nights did you stay? I've heard staying 2 nights is better than 1. Just got the book Veggies With Wedgies from the local library. My 5 yr old calls it a winner which is good enough for me. Have you ever read "Owl at Home," by Arnold Lobel? My kids love the Frog and Toad books, but I had never read this one until this weekend. We were all giggling all the way through it. Owl is hilarious. To be honest, we get most of our picture book recommendations from you (the boy is currently madly in loved with "EEEK!" also known as: Let's Sing a Song with the Brave Cowboy). But, one I think we discovered on our own is Peekaboo Morning by Rachel Isadora. Thanks for the give away! I love incorporating books into our summer activities! I'm a new reader and I really love all your photos and your posts 🙂 You've won me over. Current favorites for my 17 month old are Each Peach, Pear, Plum, Chicka Chicka Boom Boom and the Mixed Up Chameleon. But I love looking at your recommendations of things to check out from the library! Backyard camping is great for littles. We love camping! My book recommendation is Over in the meadow. This should say Skippity** Jon Jones! :) Darn autocorrect! I always feel overwhelmed when I go to the library not knowing what to pick so thanks for your recommendations for kids! what is even better than arriving with recommendations in mind? Have them waiting on hold for you! makes library trips SO much easier for me. good luck at the library! We are loving Banjo Granny in our house right now. I love kiwi crate and my husband is planning on doing some backyard camping (to break the kids in) this summer, so perfect match! Wish me luck 🙂 We just started reading A Princess Wears Hiking Boots to my daughter and my son is really into the If You Give a Mouse a Cookie books…Although we just came across Mousetronaut and I think he's hooked on space! Shoutout for Marla Frazee! Love her work. Also the Alvin Ho books are awesome! I had never thought of comparing them to Diary of a Wimpy Kid… they're definitely appropriate for younger readers than Wimpy Kid works for. I often compare Alvin Ho to Junie B Jones and to Clementine. But I like it — both Alvin Ho and Greg Heffley are boys. Alvin's in first grade and Greg is in 7th, when the each series starts. Anyway, I'm rambling now.